One of the iconic offshore distance races held every other year starts on Sunday, November 5th. 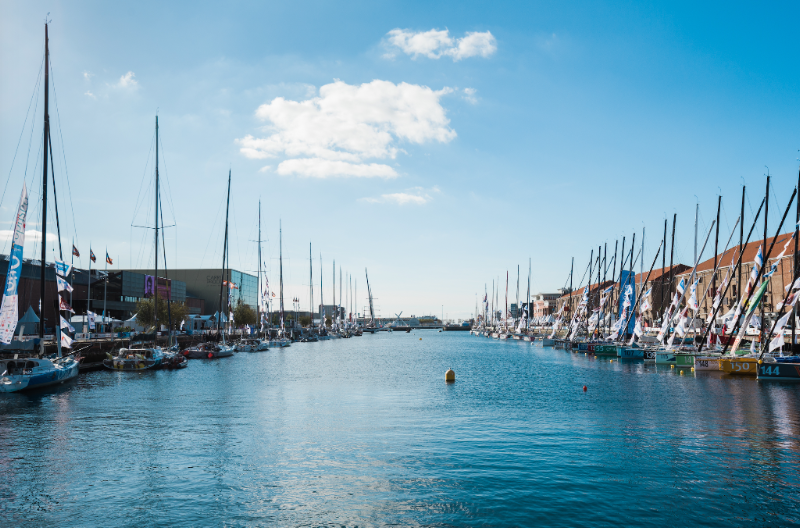 Our very own Sam Holliday is on the ground in Le Havre and below is his preview of who to watch in the Class40 race. 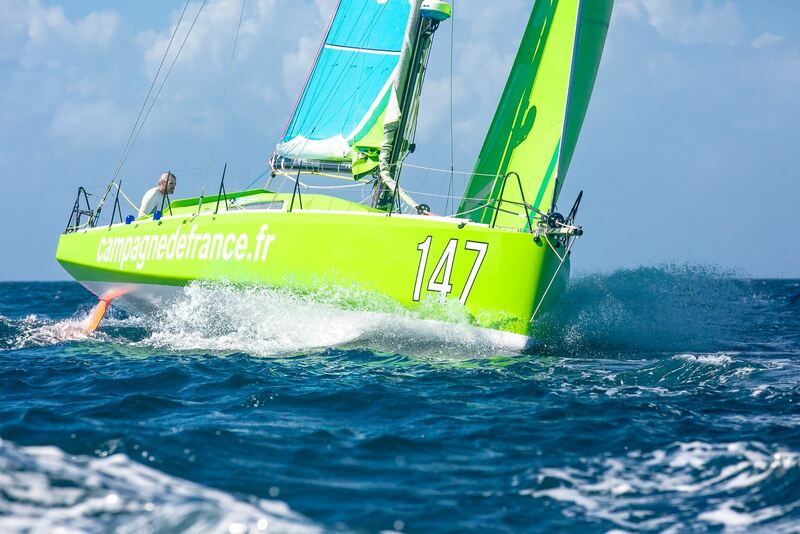 The Transat Jacque Vabre is an event that has firmly secured itself as one of sailings principle offshore races. 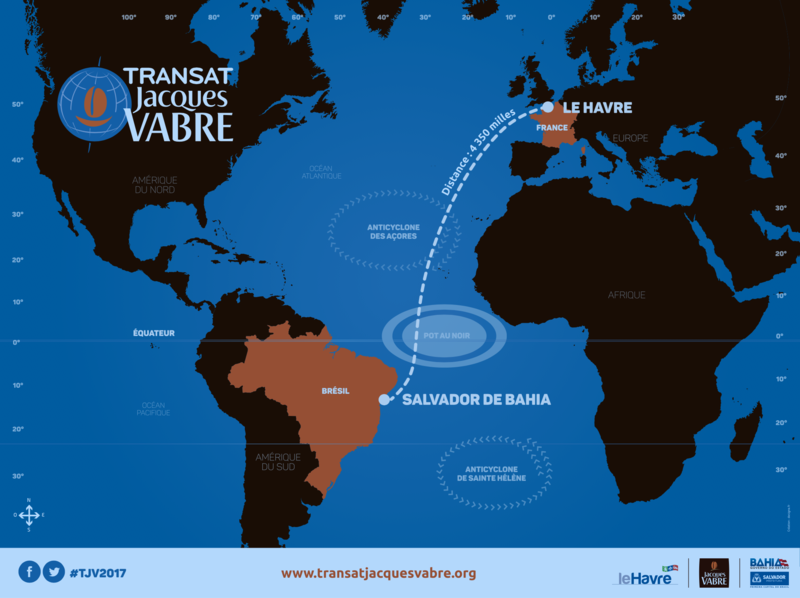 Created in 1993 when the maritime town of Le Havre and the coffee brand Jacques Vabre came together to form a solo transatlantic race to celebrate the historical coffee trade route. From 1995, the ‘TJV’ has been raced double handed and this is now the race’s defining factor. Two sailors, two ports, a biennial race and four offshore classes containing many of the world’s best sailors. The four classes are as follows: IMOCA 60, Multi 50, Class40 and the simply nuts Ultime (for those that haven’t checked them out, definitely do so!). Considering the Atlantic Cup is the only dedicated Class40 race in the United States, it is the Class40s I’ll focus on. Below is an insight into the route, and the teams I expect to be arriving into Salvador at the top of the leaderboard. Please note that the position of the teams in no way indicates my view on where in the top 5 they will place – it looks like it is going to be brutal first few days, anything can happen and realistically any one of 10 boats can win..! 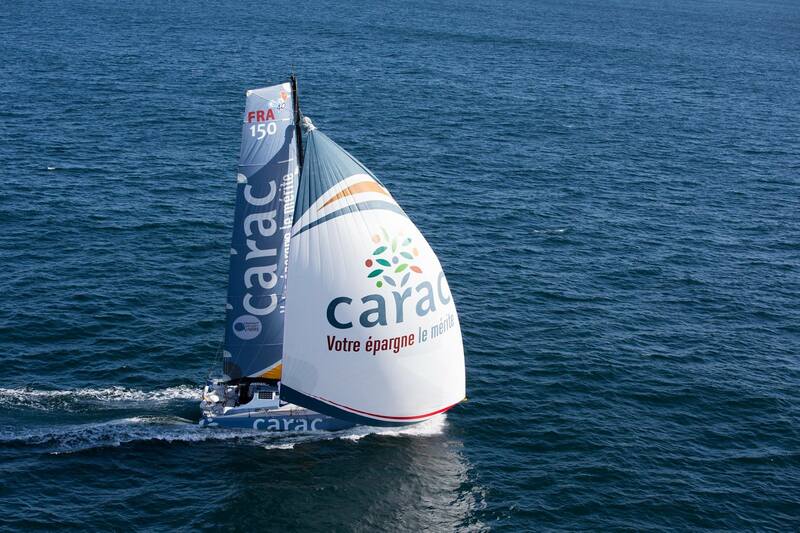 V&B: Co-skippered by former Atlantic Cup competitor Antoine Carpentier and skippered by 31 year old Maxime Sorel. 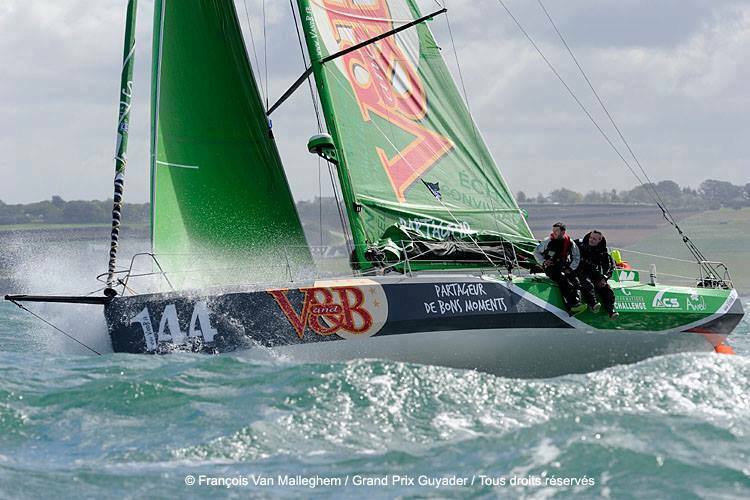 The pair recently won the RORC Fastnet and placed 3rd in the Normandy Channel Race. They have been training hard and have a good number of miles together. The boat is designed by Sam Manuard, who is known for designing fast, powerful boats and in reaching conditions expect them to fly! Carac: Skippered by Louis Duc is almost brand new but it looks like a beast and several other competitors have been astounded by Carac’s speed when the winds pick up! Louis is a very talented skipper and has been on the Class40 circuit for some time. He is joined by Alexis Loison who makes his Class40 debut. He might be new to the Class40 however he has 10 years experience on the Figaro and the pair are good friends. The boat is slightly sticky when sailing close to the wind or in very light conditions but i’m sure they’ll be near the top on arrival to Salvador. Imerys: skippered by Brit Phil Sharp and 2016 Atlantic Cup Champion Pablo Santurde are the talk of the docks. If you asked people for a favorite it would be these guys. Although sailing a slightly older boat they are a proven, well prepared team that know how to push their boat in the toughest conditions. Pablo is a remarkable sailor having won the Atlantic Cup, Fastnet, Transat Quebec St Malo, The Normandy Channel Race, Les Sables – Horta and a host of other races. 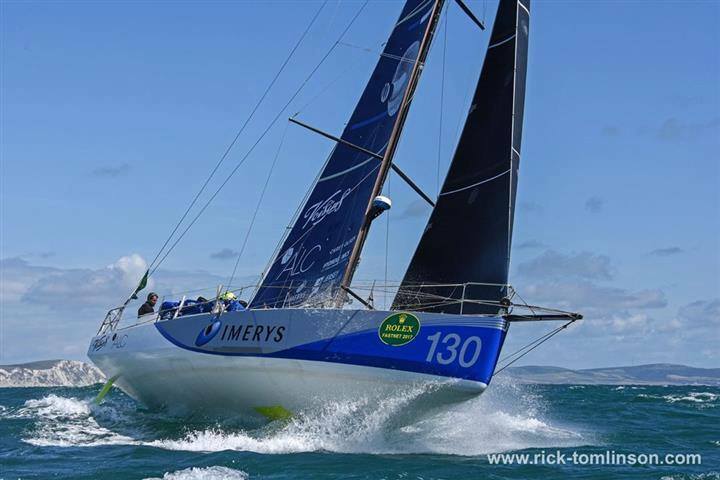 Phil has won the Route du Rhum, placed 3rd in the Transat Bakerly (arriving with a hugely damaged mainsail) and won the Normandy Channel Race in 2017. These are the guys, and what nice guys they are too! Aina is a brand new Mach 40, an evolution of Phil Sharps Imerys and the same as V&B. It is proven and both co-skippers have a vast amount of ocean miles under their belts. 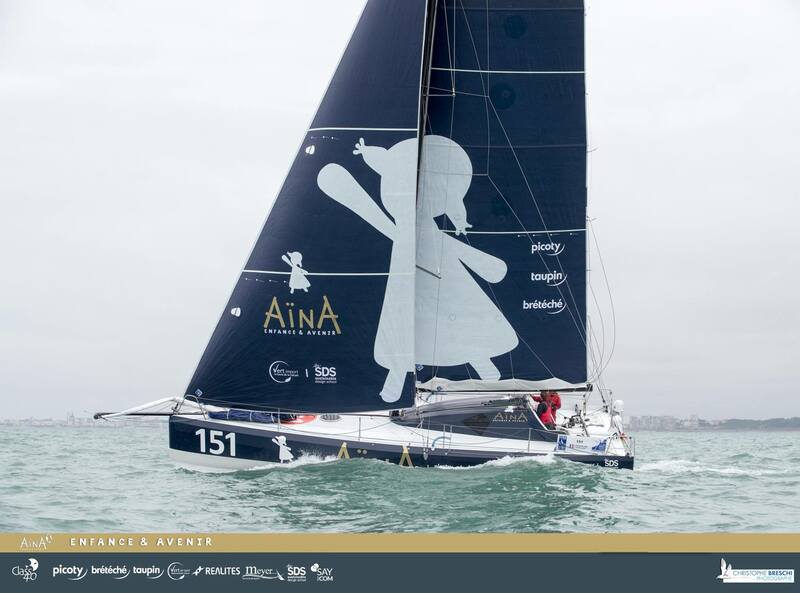 Since 2015 Aymeric Chappellier has won the Sydney Hobart, RORC Fastnet and Armen Race while his co-skipper Arthur le Vaillant has been competing in the hugely competitive Figaro circuit. They are a team I do not know overly well but they are well prepared and just ready to get on with the job ahead. The race start is scheduled for Sunday 5th November at 13h30 local time. After crossing the start line the four classes (Class40, Multi 50, IMOCA and Ultime) will sail a quick coastal route to Etretat before heading for Brittany to escape the often-dangerous English Channel as quickly as possible. They will then enter the Bay of Biscay, where, depending on the position of the Azores high, they will either find nice and fast downwind conditions or a much tougher crossing in a late autumn depression! Some 400 miles later, having passed Cape Finisterre, the northern trade winds should propel the teams quickly towards the island of Madeira and then onto the Canary Islands. At this point the northeast trade winds should be waiting. The Canary Islands can create an important tactical decision. Do crews hug the coast or head offshore? The crews position here will be important for setting up the most efficient passage of the often-horrific Doldrums which are located slightly above the equator. A good crossing of the Doldrums can be the difference between first and last! A good crossing can also set the crews up to benefit from the first southeast trade winds for the remaining 850 miles, passing by the islands of Fernando de Noronha and arriving in Salvador probably ready for their first Jacque Vabre coffee (or rum), I’ll leave that decision to you! The current Class40 record is set at 20 days, 21 hours, 41 minutes and 25 seconds. The record can be bettered but expect this race to take between 20 and 25 days.